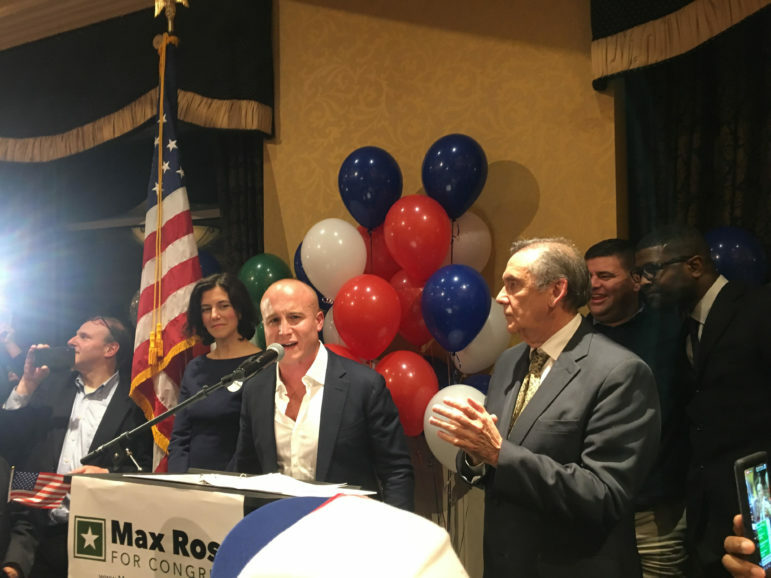 Democratic challenger Max Rose defeated Republican Rep. Dan Donovan in Tuesday’s election. In an upset, Staten Island’s Democratic challenger Max Rose took out incumbent GOP Rep. Dan Donovan by over 10,000 votes Tuesday night in the midterm elections for New York’s 11th Congressional District race, which Democrats were looking to flip as part of their effort to gain control in the 116th Congress in Washington, D.C.
At the Rose watch party, campaign supporters and volunteers, from teenagers to seniors, were glued to two television sets to watch the numbers come in after the polls closed at 9 p.m. A quick groan came from the crowd around 9:30 p.m. when Donovan was ahead by 10 votes. But an uproar broke out 10 minutes later when Rose pushed ahead to 51 percent of the votes. The crowd only got louder when the news was confirmed by Democratic Committee of Richmond County Chairman John Gulino at the podium—Donovan had called Rose to concede. The crowd went wild. “We won, we won,” Rose declared. Rose then took on President Trump’s rhetoric indirectly. 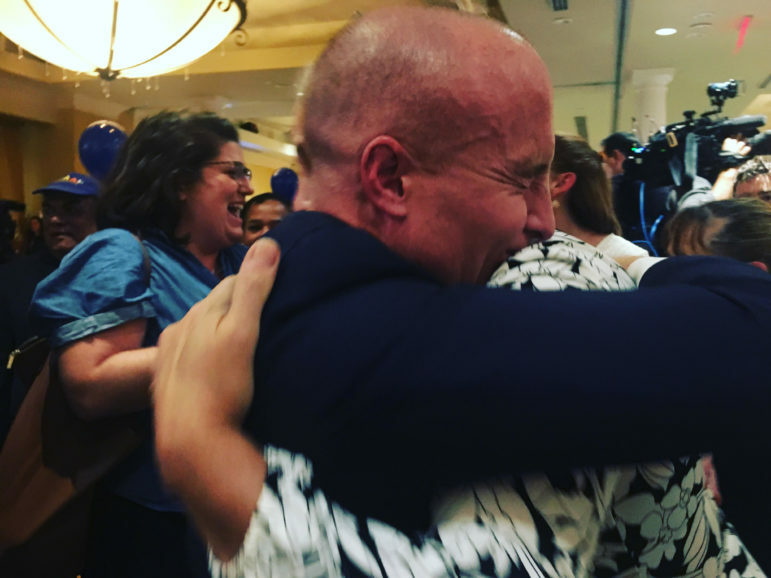 Max Rose hugs a supporter at his election night party. In Staten Island, Donovan has represented the 11th Congressional District since 2015, when he won a special election after Michael Grimm resigned from the position amid criminal allegations; Grimm ultimately pleaded guilty to 20 counts of fraud, federal tax evasion and perjury, according to federal court records. The district covers Staten Island and parts of southern Brooklyn such as the Bay Ridge and Dyker Heights neighborhoods near the Belt Parkway. As of Nov. 1, 2018, the New York State Board of Elections reported that there are 126,410 active Democratic voters and 86,766 active Republican voters in Staten Island, while the Brooklyn section of the district has 63,205 active Democratic voters and 23,539 active Republican voters. With a rainy morning start, Staten Island voters double-parked and turned on their hazard lights to run into a polling site to vote. But they would be standing in line for a while. Every booth was filled and election workers looked happily overwhelmed with the voter turnout during a midterm election year. For Staten Island voters, national and local issues like Medicare and infrastructure were important factors. But President Donald Trump’s rhetoric and support for GOP candidates during election rallies has also had an effect on voters there. Others voters said Trump’s negative rhetoric drove them to vote in the midterms. Koehler says Staten Island has a diverse community. She wants to see more investment in medical care and infrastructure, and said New York was missing out on one of the most “spectacular” waterfronts in the city. Thirty-four year old voter Nathaly Pinell had a different view on the same issue. I am a descendent of Staten island’s 1st patroon, Cornelis Melyn, who spent, (and almost lost) his life fighting for equal justice. I am very proud of my former home, and am actively engaged in progressive causes in my new home Florida. I hope it doesn’t take 400 years like it did on S.I.